I am well aware of how obvious my love for brunch food is. It shouldn’t be a surprise that this week’s recipe is an all-time favorite Sunday brunch dish. When I was a kid, my mom would make my grandma’s Swedish pancakes we called “roll-ups” every Sunday morning (her way of bribing us kids to get to church on time). This recipe has proven to be a tradition well into my adult years and is usually made on a regular basis at my house. Despite the changes I’ve made to my grandma’s recipe to make them a little more special, these Swedish pancakes are easy, delicious, and should be on your table this Sunday morning (or Saturday morning). 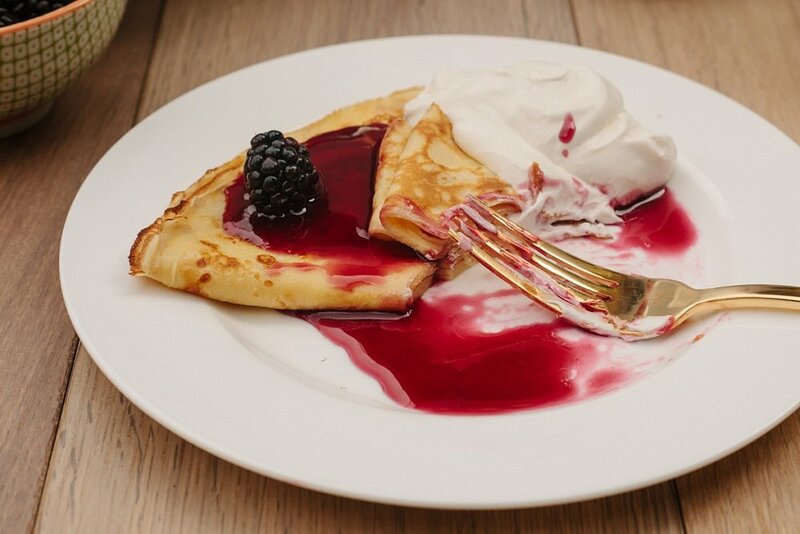 Without getting into the technicalities of pancakes, and believe me when I say there are many different types of pancakes from all over the world, a Swedish pancake is a variation of pancake with Nordic origins that is very similar to a crepe. 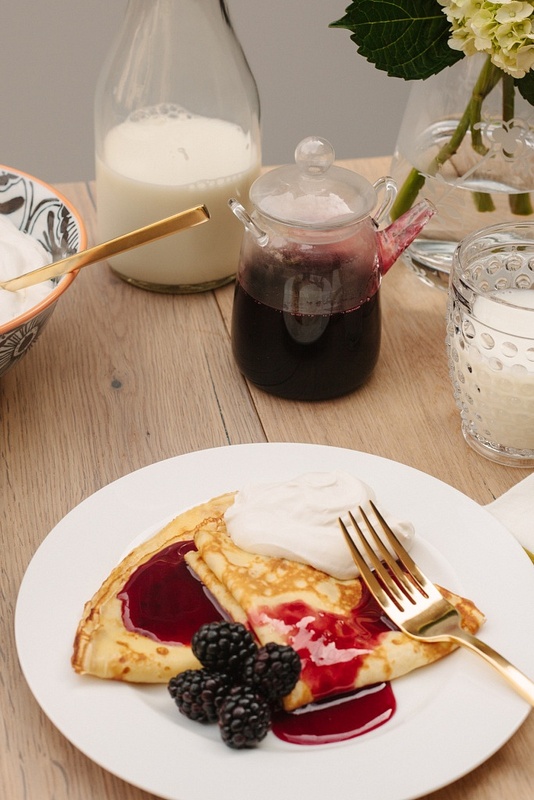 Who doesn’t love Scandinavian pastries and French Crepes?! Instead of pulling out the old Bisquick box that has been in the pantry for 5+ years, how about trying this week’s recipe that is sure to be a pancake favorite and maybe even a new tradition. In a large bowl, beat eggs, milk, sugar, salt, butter, and vanilla until combined. Whisk in flour and zest into custard mixture until no lumps remain. The batter will be very thin (if too thin, add a couple extra tablespoons of flour). Heat a 12-inch non-stick skillet over a steady medium heat. Using a pastry brush, coat the heated skillet with margarine, don’t forget the sides (I use margarine because it has a higher smoke point than butter and tastes a little better than oil). Pour a ¼ cup of batter into the hot skillet tilting and swirling the pan to evenly distribute the batter. Cook batter until the underside of pancake is golden brown, about a minute or so. Using a rubber spatula (or any spatula that works best for you), loosen the sides of the pancake and flip cooking the other side until golden brown, another minute or so. Using the spatula, fold pancake into quarters and serve immediately. Continue to cook the rest of the batter. Serve with fresh whipped cream, lingonberry jam, strawberries, raspberry syrup, butter and powdered sugar, whatever your heart desires.Baker’s Notes: Always keep an eye on the heat. Some ranges tend to be very hot while other don’t get hot enough. Swedish Pancakes cook best on a hot skillet so they can form golden brown spots. Using your best judgment, you may need to keep switching the temperature on your stove back and forth to keep your pan consistent with heat. If your pan gets too hot, remove it from the stove for a couple seconds.